Ownership / Access: Accessible open space. 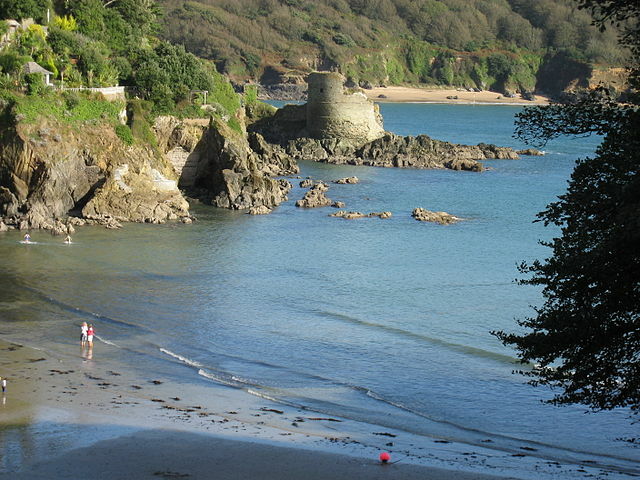 Notes: Salcombe Castle or Fort Charles is a ruined fortification just off the beach of North Sands in Salcombe, Devon, England, within the South Devon Area of Outstanding Natural Beauty. It is located on a rocky outcrop which is easily reached on foot at low tide. The castle is thought to have been constructed originally during the reign of Henry VIII, to defend the Kingsbridge estuary against French and Spanish pirates. It was the last place to hold out in the Royal cause against the victorious Parliamentarian troops of Oliver Cromwell in the English Civil War. Sir Edmund Fortescue was ordered to hold it in 1643, when nearby Plymouth rose against the king; he rebuilt the castle at a cost of 135 6s 11d, and gave it the name "Fort Charles". The castle was besieged from 15 January to 7 May 1646, and surrendered then only because it became clear that all other royalist strongholds had been overrun; the garrison were allowed to withdraw with their colours flying. After the Civil War the castle was "slighted" (ruined) on the orders of Parliament as it was "too dangerous" to allow it to remain. The Sealed Knot staged a reenactment of the siege in 1996 to commemorate its 350th anniversary.